tching to know who’s playing Zilker Park this October? Well, scratch this! Play the ACL Lineup Lottery every day between Friday, May 18th and Monday, May 21st to discover the acts appearing at the 11th annual Austin City Limits Music Festival! Be sure to follow us on Facebook and Twitter and check THIS website at 10AM CT each day when we will announce the names of 7 unique, local Austin businesses where scratch & win tickets can be found. 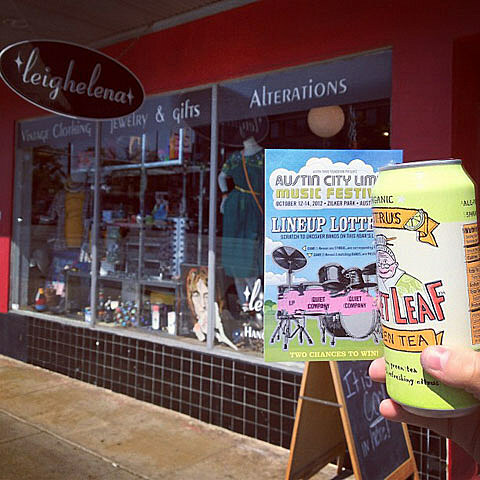 Swing by one of those fine establishments, pick up your ticket and scratch away to reveal a band playing at ACL Festival, October 12-14. Once you figured out who is playing, head over to Facebook and Twitter to spread the word! Don’t miss your chance to win! Match 3 bands and win awesome prizes including, VIP Passes or 3-Day Passes to ACL 2012, official merch, haircuts from Bird’s Barbershop, cupcakes from Sugar Mama’s Bakeshop, Ice Cream Sammys from CoolHaus, and $15 for grub at Galaxy Café! Good luck! You can see a shot from one of the ticket locations, Leighelena, above. Full list of locations at ACL’s website. Today’s reveals are: Steve Earle, Delta Spirit, Punch Brothers, Quiet Company and LP. A new list of locations and then bands will be revealed on Saturday, Sunday and Monday.